Refund and Return Policy at Music Supply Company, Inc. If, for any reason, you are not satisfied with a product we manufactured, you may return it to us within 30 days of purchase for a refund of the purchase price. The refund would be a credit to the card used when you made the purchase. 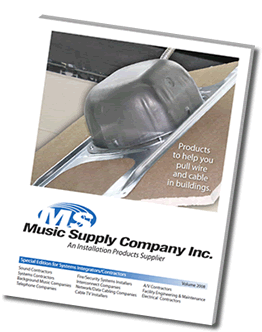 Other Products Distributed by Music Supply Company Inc.
Other products manufactured by companies such as CADDY FASTENERS, GREENLEE and others, but distributed by Music Supply Company Inc., would fall under the respective manufacturer's policy. Music Supply Company Inc. reserves the right to make changes to this Refund and Return Policy without notice.